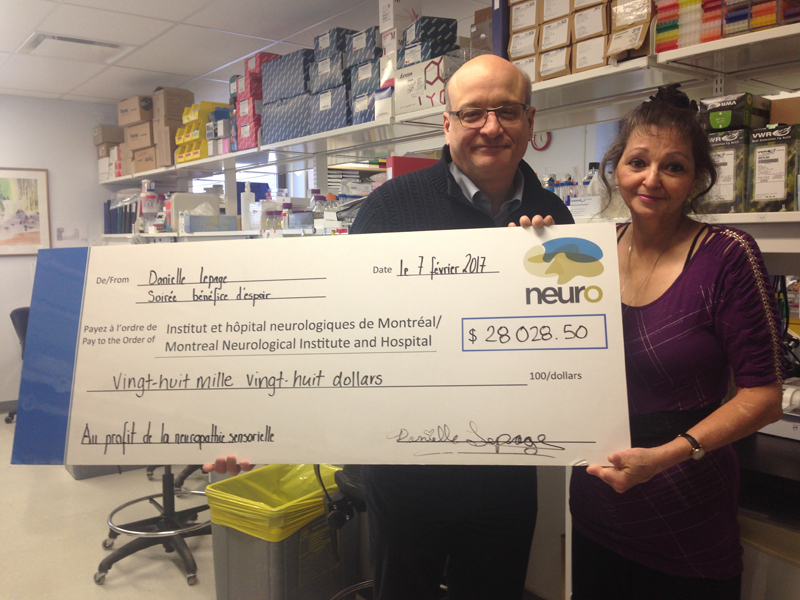 Danielle Lepage Bonin has been raising funds for research into sensory neuropathy since 2009. This year, though plagued by health problems, she was still able to raise $28, 028.50 to support Dr. Brais’ research into this rare genetic disease that disproportionately affects Quebecers in the Lanaudière region. Danielle’s devotion to this cause is well known in the community – the residents of Saint Thomas, Joliette, and the surrounding areas have contributed more than $227, 000 through her fundraising drives and because of her motivation over the past eight years. Congratulations and sincere thanks to everyone who has volunteered their time, given silent auction items, and donated to this important cause! Stay tuned for information about next year’s fundraiser! Register today and raise much-needed funds for The Neuro by completing a 5K, 10K, or 21K run! Even children can participate in the 500 metre dash! Detailed registration instructions are available here. Use promo code 17NEURO5k, 17NEURO10k or 17NEURO21k for a $15 discount on your registration! For more information or to register, please call 514-398-5785, or email us! Cocktails; 5 p.m. Dinner: 6 p.m.
Saturday, April 1, 2017, 7–10 p.m. Teams of 6, reserve your lane with Anna Colannino : (514)-648-8284 or via Facebook. March is for Monthly Giving! Every single day, 365 days a year, professionals at The Neuro are busy working on behalf of our loved ones. They will not rest until they find better treatments for those suffering from some of the most debilitating diseases and disorders of our time, but they need our help. Please join our monthly giving program today by using the DONATE NOW button (below) and selecting “recurring” as your gift type. Thank you! Under the baton of Maestro Gilles Auger, I Medici is performing at an afternoon of French music – a Benefit Concert for Quebec Parkinson Network.